Some years ago I went to Nigeria to teach Technical English in a College of Agriculture. I was assured I would be provided with suitable text-books supplied by the World Bank, which turned out to be Cold Comfort Farm, presumably on the grounds it sounded ‘agricultural’, and The Mayor of Casterbridge. It took me quite some time to convince the students that wife-selling was not a regular feature of British society. But, of course, it wasn’t so long ago that was. Ordinary people throughout history have frequently been at odds with the legal and religious authorities on marriage and divorce and often come up with their own unofficial solutions. Handfasting started as a betrothal ceremony in Saxon times when the couple would swear to be faithful to each other for a year, after which the engagement was either annulled or a full wedding would take place. 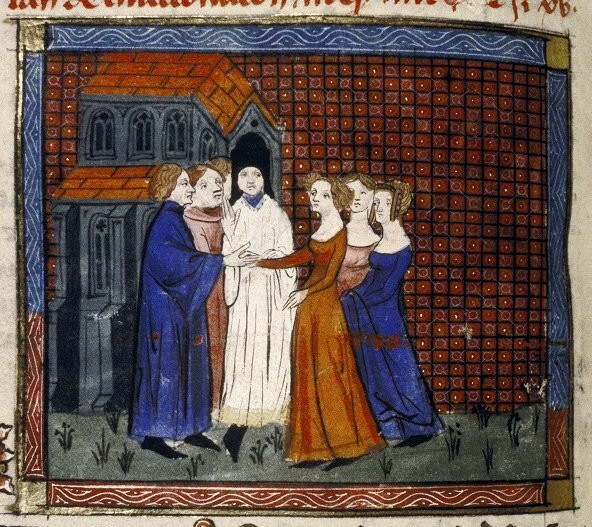 In the Middle Ages it became a lay wedding ceremony performed by the couple and their families without a priest, who often couldn't afford all the various scots and taxes involved in an legal wedding. And if man’s wife ran off, or a woman’s husband had gone missing in war, the Church deemed they were still married unless they could prove their spouse was dead. If they could not, the abandoned partner could not remarry, so handfasting was also a way round this. Likewise, wife-selling became the poor-man’s divorce. It had been unofficially practiced in the England since the 1400’s when it became increasingly difficult for those without money or power to obtain a divorce. It was not really a sale, but it was governed by all the market rules in order to make it binding in the eyes of the local community. All three parties would agree the sale in advance. On market day, the wife would be led to the market place by a halter round her waist, and sold in the manner of a mock auction. The market officials, who verified the sale of any item in the market, could then act as witnesses that the former husband was free to remarry. From the 1800’s the authorities tried to stamp down on it, which in 1847, led to curious trial in the respectable little market town of Barton-upon-Humber in North Lincolnshire. An announcement was made that the wife of George Wray of Barrow would be offered for sale by public auction in Barton Market Place. She was duly led there with the halter round her waist and sold to William Harwood, waterman, for 1s.3½d. The sum having been handed over and witnessed, the money was returned to William Harwood in the former of ale to celebrate his new union. All parties, included the woman, were said to be delighted. However, the celebrations were short lived, for both men were summoned to appear before magistrates in Kirton-in-Lindsey on a charge of misdemeanour to which they pleaded guilty. Not that they could dispute it, considering the whole town had witnessed the transaction. They were sentenced to two months imprisonment after which they returned home to their new brides. It was accepted among ordinary people that neither the old or new husband could be pursued for the debts of the wife, if a ‘petticoat wedding’ had taken place showing that the wife had taken nothing from her former marriage and brought neither debts nor goods to the new one. I imagine there are quite a few celebrities, forced to pay out thousands in divorce settlements, who look back with envy to the ‘good old days.’ On the other hand they may like to take comfort from the knowledge that, in a custom dating back to the 1300’s, there were two villages in England which annually awarded a flitch of bacon to the couple who had ‘not repented of their marriage for a year and a day.’ One was Great Dunmow in Essex, the other was Wychnor in Staffordshire. However, throughout all those centuries the Wychnor flitch has never once been awarded! If a wife was sold, what happened to any children? Interesing post Karen. 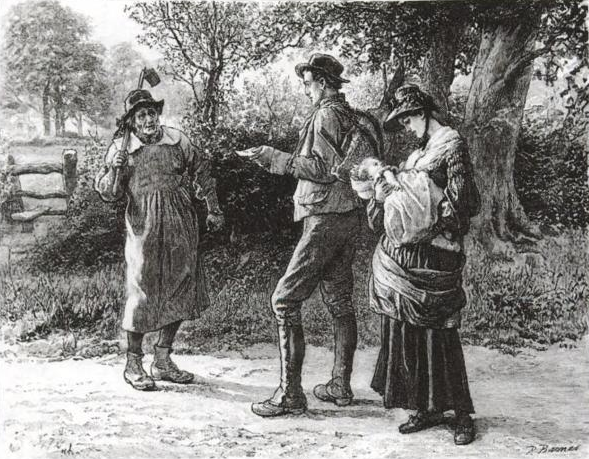 I have an ancestor who immigrated to Australia as a free settler in early penal times, ie 1801. and Shortly thereafter, it was reported that he "sold" his wife for a black pig, and some other items to a farmer in the nearby area, where she had been working as a housekeeper. This explains this to me, and puts a new slant as to why he "sold" her! Basically I can insert "poor man's divorce" in place of the work 'sold'. Can't thank you enough.